707 Operation's double headed steam trip to Seymour and the Tastes of the Goulburn Festival with R707 and R711. 707 Operation's first steam tour with R707 for 2014 for a Sunday trip to Geelong and extended tour to Queenscliff with the Bellarine Railway. 707 Operation's first weekend and overnight train with recommissioned Vinelander carraige SJ284 and return mainline service Y127 to run with T413 to Deniliquin via Seymour, Toolamba and Echuca. 707 Operation's first tour of 2014 with T413 to Ballarat and the Ballarat Beer Festvial. The trip ran North Geelong to Ballarat for an afternoon at the Ballarat Beer Festival. R707's last outing for 2012 was an evening return trip from Southern Cross to Seymour. A stop was was made at Tallarook to give passengers the opportunity to dine at the Tallarook Hotel (a traditional street corner two storey country pub). 01 December 2012. Slow start - just clear of the Southern Cross platform R707 waits for a signal to clear. Photo Steve Hoptroff. 01 December 2012. Finally underway to Seymour. Photo Steve Hoptroff. 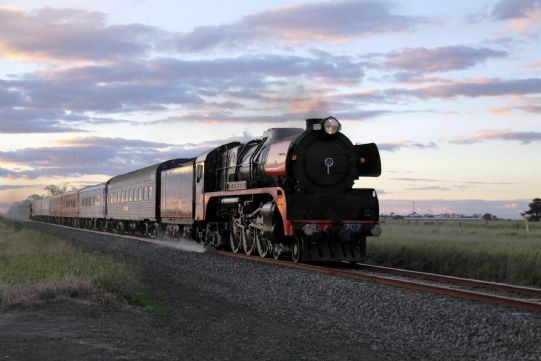 R707 was chartered to Steamrail to double head with R761 their Maldon Experience train to Castlemaine and Bendigo. 707 Operation's first 2012 trip was to Seymour for the monthly Craft and Produce Market. 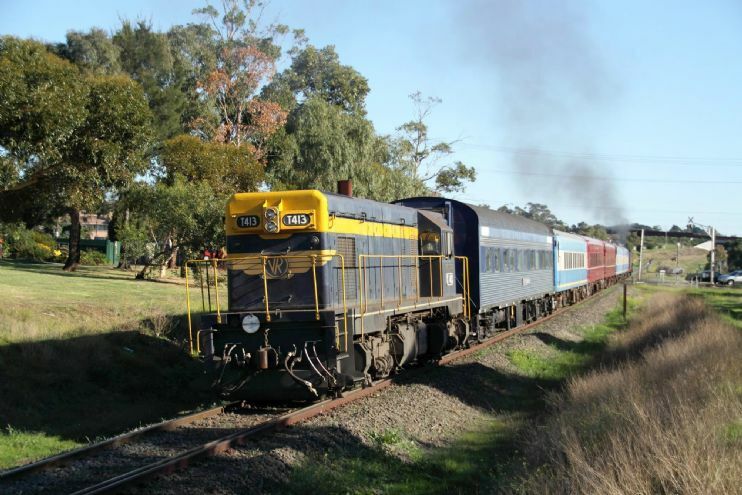 Passengers were also offered side trips to the Kerrisdale Mountain Railway and the Tahbilk Winery. Both were heavily booked. The train was quite heavily loaded and an additional carriage BK700 was borrowed from Steamrail to avoid crowding. Unlike 707 Operations own carriages, BK700 is not air-condioned and quite a few passengers choose to ride in it to improve their exposure to steam, smoke and smuts. 04 December - Suburban "Steam & Cuisine"
This was R707's first outing under our own Vintage Rail Travel banner since the completion of extensive boiler work in the first half of 2011. The engine ran perfectly. Due to the abscence of turntables at both ends of the journey the trip unusually involved 50% tender-first running. Passengers joined the train a Southern Cross Station for a short trip to Craigieburn before R707 ran around the train and took the back way to Newport Railway Workshops where passengers enjoyed a professionally-catered barbeque lunch beside the historic Gardens Platform and workshop clock tower (and R707was serviced). After lunch the train ran to Frankston before returning to Sourthern Cross Station where passengers disembarked. The almost uninterupted run back to the city was particularly appreciated. 04 December 2011. R707 at Craigieburn. Photograph Steve Hoptroff. 04 December 2011. R707 at Frankston. Photograph John Green. 04 December 2011. Tender-first running. Photograph Steve Hoptroff. Steamrail hired R707 for a double headed trip to Bendigo with R761. 17 September 2011. R761 and R707 leave Southern Cross for Bendigo. Photograph Steve Hoptroff. This charter was R707's first mainline run since the completion of boiler repairs in the first half of 2007. 2011 is the 60th anniversary of the R Class steam locomotive into VR service. To mark the occassion R707 carried a commemorative headboard on all 2011 trips. 24 July 2011. R707 and train on the way to Bacchus Marsh. Photograph Steve Hoptroff. 24 July 2011. Rolf Jinks and David Goodie provide the power to turn R707 at Bacchus Marsh. Photograph Steve Hoptroff. 24 July 2011. R707's 60-Year commemorative headboard. Photograph Steve Hoptroff. 24 July 2011. R707 and train wait in the Bacchus Marsh sidings while the scouts have lunch. Photograph Steve Hoptroff. This was a repeat of the sold-out Mother's Day trip to Ballarat for the Heritage Festival Weekend. Perhaps due to world-wide financial uncertainty, bookings were much lower than in 2010. Unfortunately boiler repairs to R707 could not be completed in time for the trip and the train was hauled by Steamrail's R767. We thank Steamrail for their cooperation. 2010 was the 30th anniversary of the formation of the group called "Plan R" established to overhaul and return steam locomotive R707 to mainline operational condition. 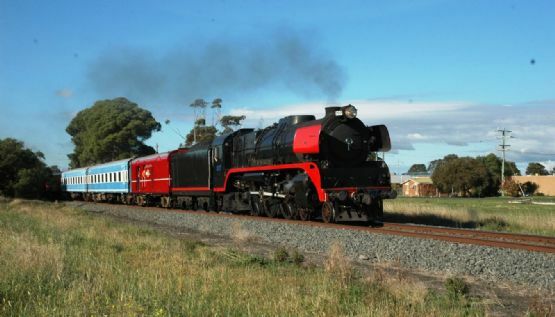 It was also the 25th anniverasry of R707's first mailine excursion (to Bacchus Marsh) after restoration. To mark the occassion we planned a celebratory re-run with a lunchtime steam trip to Bacchus Marsh. Unfortunately R707 was unable to make the journey due to the need for boiler repairs found in the post-trip inspection following the locomotive's run to Bendigo on 08 October. 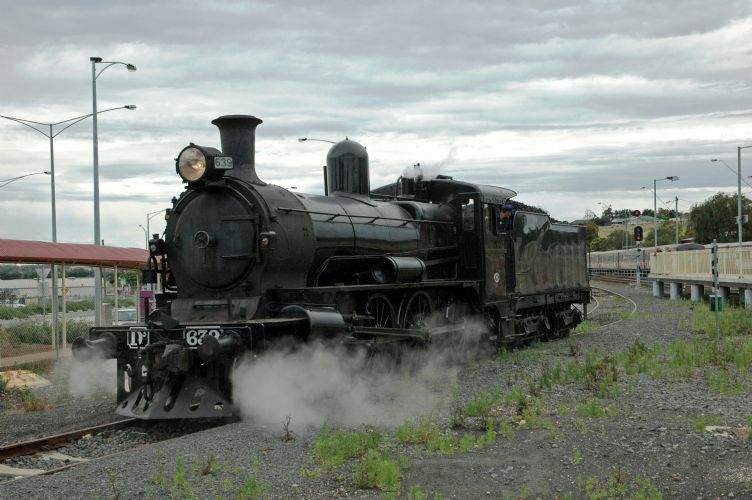 Instead the trip was run using D3 639 kindly provided by Steamrail. In view of the age and size of this locomotive the train was reduced to three carriages. For information on the restoration of R707 click on R707 Restoration. Steamrail's D3 639 and the 707 Operations train pause at Rockbank for a V/Line service to cross. Steve Hoptroff. 07 November 2010. The trip was timed to take our passengers to Seymour for the monthly Craft and Produce Market. It left Newport Garden Platform on time but a signal pathing problem resulted in the train being held at Newport Metro Station before running to South Kensington from where our diesel-electric T413 pulled the train all the way back to Newport Garden Plaform to start again. Unfortunately the situation not only meant our passengers were late at the market, but also resulted in significant delays to both Metro and V/Line trains. The trip introduced two new customer choices - passengers could either reserve an entire compartment in the BS carriages for their sole use or they could reserve a "Hudson Gold Class" cabin in Kim Baxter's sleeping car Kuldalai with morning and afternoon refreshments provided. Both options proved very popular and were quickly booked out. The repainting of carriage BRS224 into Vintage Rail Travel red livery has been completed and Seymour was the carriages first outing carrying it's new name "Williamstown". The train was marshalled for the first time with all the red vehicles together. 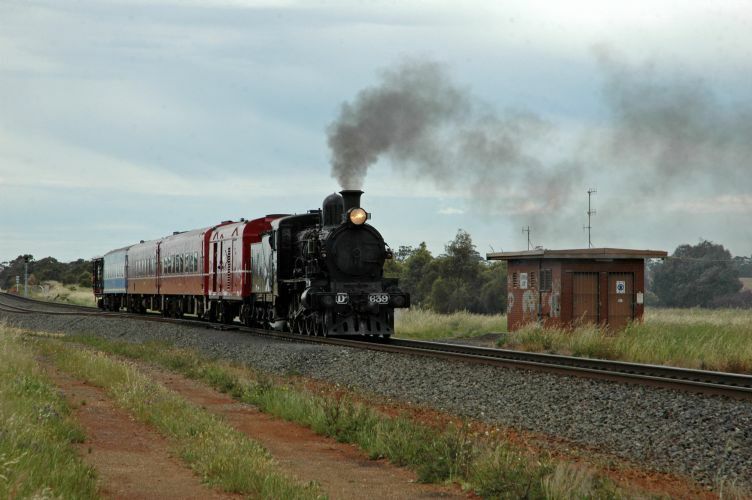 The trip was run in conjunction with the Ballarat Heritage Weekend festival and the Ballarat City Council arranged two free-of-charge return shuttle trips from Ballarat Station up Warrenheip Bank to Lal Lal as part of the weekend festivities. The shuttles were topped and tailed by R707 and diesel electric T413 with R707 leading up the bank. The trains were near full and a total of 781 passengers were carried during the day. 707 Ops Train on the way to Ballarat. 09 May 2010. Photo Matt Cantle. May saw Southern Star Productions hire diesel locomotive T413 plus ACZ255, BZ270, PC294 and DT318 to film an episode for the third series of the police series "Rush". Filming took place between Lethbridge and Warrenheip on the Geelong-Ballarat line and required total occupations on both days. The third series of Rush commenced on Channel 10 on Thursday, 22 July. 707 Operations ran a return diesel hauled charter to Seymour for the AREA on 08 January. T413 was accompanied by carriages ACZ255, BRS224 and sleeper car "Kuldalai" (JTA6) plus power van PCP294. 22 March - Return trip to Colac with a shortened 3-carriage consist topped and tailed by T Class diesel-electric locomotives (due to the steam ban season and the abscence of run-around facilities at Colac). 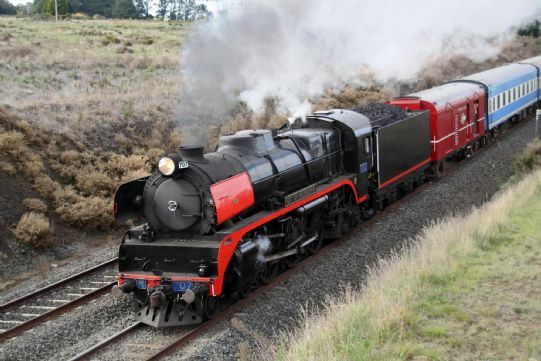 On the outward journey the train was hauled by 707 Operations' T413 with Steamrail's chartered T356 trailing. The roles were reversed for the home trip. Our thanks to Steamrail for providing T356. 09 May - After summer maintence R707 took a short evening test train to Bacchus Marsh. 17 May - R707's first public trip for 2009. The engine took three carriages to Geelong. Loading was light but the trip was most enjoyable for both passengers and crew. T413 trailed on the rear to reverse the train from Newport Garden Platform to Newport station and return. 13 June - R707 hired to Steamrail for a doubled headed trip with R761 to Castlemaine and Bendigo (Castlemaine 125th anniversary celebrations). R707 has been a reliable performer but it blew two superheater tubes and did not steam well on the return trip. 03 August - With R707 out of action for maintenance on the braking system Steamrail kindly provided K153 for use on this trip. Loading was again light and a shortened formation was used. Passengers who took the optional wineries bus tour enjoyed an excellent light lunch at Moorabool Ridge Vineyard and Olive Grove. 13 September - Brakes fixed, R707 was back in top condition for the return trip to Ballarat via North Geelong. Booking was heavy and the train load was increased to over 300 tonnes with the addition of Kim Baxter's Overlander sleeper car Kuldalai (JTA6). Some spirted running saw the train top the 1 in 72 Lal Lal bank at over 60km/h. Approaching Lara with sleeper Car Kuldalai behind R707 on Ballarat trip 13 September 2009. Photo Dale Smith. Departing Werribee for Ballarat on 13 September 2009. Photo Steve Hoptroff. 05 December 2009 - R707 and T413 took three carriages for a "Saturday Evening Suburban Steam Soiree" around parts of the suburban rail network. The train departed from Newport Workshops Garden Platform around 3pm and travelled to Lilydale the long way around via Glen Waverley and Flemington Racecourse stations. At Lilydale passengers were served a light barbeque dinner in the historic railway refreshment rooms located on the station platform before the train, with T413 leading R707 returned to Newport at 11pm. 16 June - Charter trip for a group of over 260 Monash District Scouts from Southern Cross to Bacchus Marsh. The scouts had lunch in the park adjacent to the station while R707 was turned and serviced. 10 August - A trip for 707 Operations members and guests on a rather cold and wet day from Newport Garden Platform to Marshall. The train carried about 110 passengers and R707 was crewed by 707 Operations members Rod Giri (driver) and John Nunn (fireman). It was John's final steam roster before retirement as a V/Line driver. For operational reasons our diesel electric T413 was attached to the rear of the train. T413 was used to pull the train from Garden Platform into Newport station (reverse), back from Marshall to Geelong station (where the locomotives exchanged ends after R707 was serviced and turned) and finally to pull the train back into Garden Platform from Newport Station. The highlight of the trip was the climb out of Geelong through Geelong Tunnel. Pressure waves from R707's exhaust found every weakness in the sealing of the air-conditioned carriages and by the time the train left the tunnel visibility was less than a coach length due to a thick (and very smelly) interior smog. Exiting Geelong Tunnel on 10 August 2008. Photo Steve Temple. 31 July - Public excursion to Bacchus Marsh.